Schoolboy Arthur Crisp having his flag autographed by an Indian soldier following the 7th Division parade in Brisbane in August 1944. 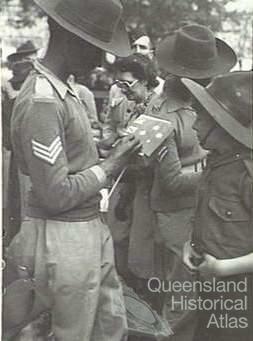 Brisbane families attended such parades to show their support for the war effort, and the small number of exotic Indian troops in Queensland would have made Arthur’s autograph something of a collector's item. While the slouch hat is often thought of as intrinsically Australian, it was also a common item of headgear in the Indian Army.